The typical classroom experience used in high school and college is fundamentally broken, but there’s a simple solution. 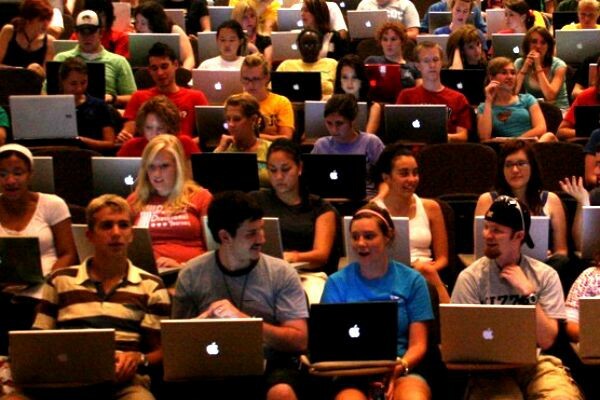 In a recent NY Times op-ed, Susan Dynarski, a professor of education, public policy and economics at the University of Michigan, describes why she has forbidden students from using laptops in her lectures. There’s now plenty of data that shows that in a lecture setting, students with laptops don’t do as well or learn as much as students without one. The reasons make sense, and I applaud her standards and her guts. But she missed the real issue. That’s like performing a new episode of Star Wars for every audience, every night, from scratch. It doesn’t make a lot of sense. Instead, why not give the lecture, record it and then share it with the students in between classes? Let them watch it on their own schedule, at double speed, or half speed. Let them look stuff up, take good notes and rewind and review the tricky parts. Challenge them to study the lecture and then come to class ready to discuss it. Even better, with the lecture in digital format (either as a video or in writing), there’s zero cost to sharing that lecture with students in Kibera or Geneva. Or, once we go down that path, no cost at all to bringing an even better lecturer to the class, one who has never been to Michigan and can’t possibly make the trip every week. When the very best lecturer in the world is able to give her lecture to 100,000 students in 20 countries instead of thirty or forty on one campus, the experience will inevitably improve. And we can let teachers get back to their real job. And what about precious classroom time? Wasting this coordination on a lecture is a little like making a tuna sandwich from bluefin. It’s so wasteful as to be a sin. Alas, this either requires the teacher to merely recite and parrot what the committee-created curriculum instructs, or puts a huge demand on them to deliver original and useful insights on a regular basis. It usually devolves to the former. College ought to embrace the inquiry and responsibility that comes from abandoning the in-class lecture, but alas, colleges often take the easy way out and offer a version of high school, but with more football and binge drinking. An hour in a college lecture hall costs about $100 on average. Per student. More at a private school like Notre Dame. Much of that goes to debt, which might take decades to pay off. It’s absurd that even 5% of this expensive and scarce time is spent listening to professor deliver prepared remarks so that everyone in the room can write down what’s being said. In the Marketing Seminar, we’ve discovered that a focused 8-minute lecture, delivered by video, can lead to hours of useful interaction and discussion, enough to change the way professionals do their work. The same approach can work for any group of focused, enrolled students intent on getting their money’s worth as they work to move forward to the future they’ve signed up for. A great teacher is smart enough and connected enough to run an interactive conversation, a participatory seminar in the concepts that need to be learned. We shouldn’t even consider wasting a professor’s time on real-time monologues. The solution isn’t to ban the laptop from the lecture. It’s time to ban the lecture from the classroom.